Gone are the heady days of adventure and exploration, here on our tiny planet, where anyone could strike out on a voyage of discovery to make their name, make a fortune. Long gone. The days when Darwin set forth in the Beagle and sent back specimens of exotic flora and fauna. The days of the great plant hunters like Sir Joseph Banks, who sailed with Captain Cook and introduced plants like eucalyptus and acacia to Europe. I am sure that even today there are innumerable undiscovered species lurking under rocks, in the deepest jungle, or clustered around deep sea vents. It's just that... well, it's too much like hard work to find them, isn't it? Wouldn't it be better if we could cross the next great frontier and get out there to explore the rest of the universe? That is what Encyclopedia Galactica, the new game from Jonathan Cauldwell, imagines: it is, quite literally, exploration on rocket fuel. That's not to say it is adrenaline soaked or delivered at a breakneck pace. On the contrary, the game plays at a gentle trot, and patience and methodicalness are rewarded over an itchy trigger-finger. Galactica puts you in the shoes of Dr Theo Rao: one scientist with a whole galaxy in front of him, star systems to explore, and new lifeforms to discover. All in a tin can of a spaceship that's like a GTI version of the one those kids made out of junk in Explorers. You must scour the galaxy and catalogue all life, from microscopic plankton in the oceans to intelligent - and sometimes aggressive - aliens. Many lie somewhere in between: fungi, herbs, fish, molluscs, birds... but mostly it's a menagerie of weirdness, as you'd expect. Each organism requires an entry in the (no doubt esteemed) Encyclopedia Galactica, which it's your job to write. To do so, you must capture three different specimens and research them in your ship. 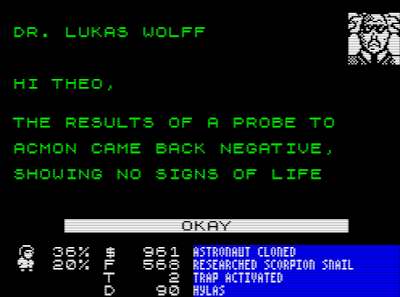 This takes time, but Theo must be a diligent worker as you make continual progress as you play. Only when the research is done will you be paid for your labour. Every space explorer needs credits to get around, so the money you make from completed entries is central to the game. It can pay for ship repairs, refuelling, and special equipment for the mission. Most useful are the tranquilliser darts that sedate dangerous creatures, but you can also buy stasis traps to capture elusive ones, and extra cages to increase your research capacity. Otherwise, you can only research two organisms at any one time. You can even upgrade your ship with an essential plankton filter, a scanner to detect organic life, or a better engine. 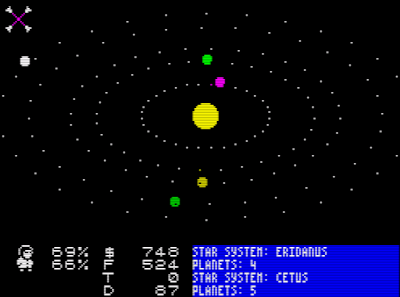 You can roam freely around all eleven star systems in the neighbourhood from the start of the game, accessing them from a central star chart. 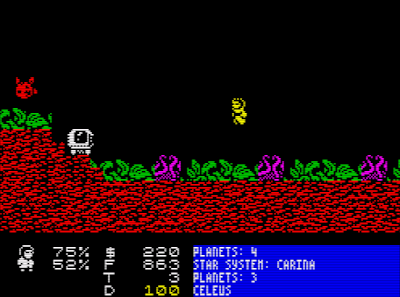 Each system has between three and six planets and the arcade segment of the game is where you take control of Theo's lander craft and conduct a survey of each planet's surface. It's a bit like Defender for pacifists, except the planets can be explored downwards as well as left and right and there's infinitely more variety in the landscapes and their inhabitants. You can even explore underwater, hence the need for a plankton filter. Gravity varies from planet to planet and exerts a realistic force on your craft, which can thrust up, left and right and has a decent top speed but woeful acceleration, making it slow to turn around. Some planets are completely barren and devoid of life, whereas others are teeming with it; others still are gas giants and there's no surface to explore. To collect a specimen you must land your craft and disembark. 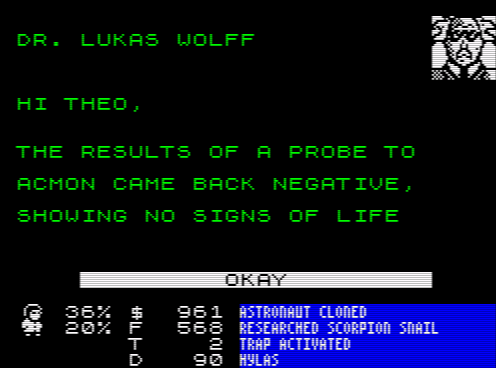 Theo, in his spacesuit, can jump and fire tranquilliser darts, but that's about it. Some aliens are easy to catch, but for others you need to be patient or quickly sedate them with a dart. It's a really nice touch that each species behaves quite individually so you need different strategies for capturing them: some are timid and will flee, others will attack without hesitation; some move in predicable patterns, others flit around at random. 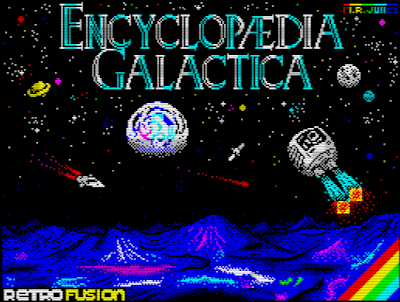 Encyclopedia Galactica has a strong and original premise, and it is fun and rewarding to play. The pacing is rather langorous, driven as it is by the time it takes to research each specimen you collect. I found it quite refreshing to be honest, and it is broken up by neat sub-games where you have to cross asteroid fields or unscramble the DNA of new life forms to win bonus credits. Although there are dangers to Theo and his ship, there is nothing that truly threatens to end your mission (unless you disembark in a lava pool, like my esteemed editor did)! 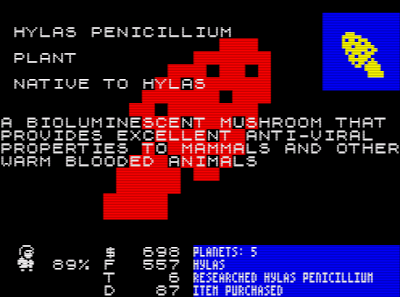 Asteroids and reckless driving can damage your spaceship, as can cloning your spaceman, should he meet a sticky end, but you can always return to your space station for repairs. The challenge lies in finding every last organism in the galaxy, and ensuring you make enough money and have enough fuel to finish the job. The game's main strength is the impressive variety of planetscape and life forms that you encounter, and it's always a kick to read the EG's low-down on the critter you just discovered. There are volcanic planets, ocean planets, planets with underground caves, ancient ruins and monoliths, tunnels and mine shafts, jungles, lakes and mountains. There's even an ice planet where you can go through the crust of ice and investigate the ocean below. I loved the variety and creativity on display. The thrill of discovering the unknown and uncharted should not be underplayed. This game really captures that: you do feel (ridiculous as it sounds) like an intrepid explorer treading virgin ground when you first arrive on a new planet. The feeling is similar to the early exploration stages of a game of Civilization, when you just don't know what you are going to find. It would be even better if there was a random element to the game, mixing up where specimens could be found, but it just isn't constructed like that. Your space craft and astronaut move around smoothly and realistically, as do the various alien creatures. 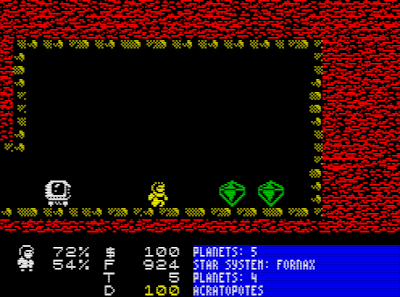 Graphically, the game is a bit inconsistent, with some great touches but also some elements that feel under-designed or unpolished, with the odd bit of colour clash or sprite clash. The shop and space station are certainly examples of the latter, whereas the asteroid sub-game plays well and is just tricky enough - but the asteroids themselves wobble and flicker slightly. 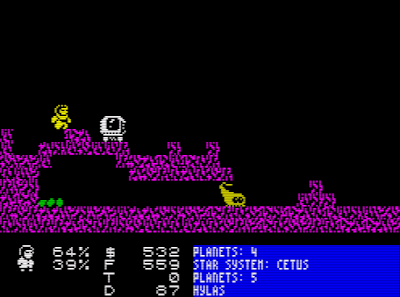 It could also be said that some of the planets feature rather blocky mountains, but it doesn't detract from the game and I suppose with only 48k the scenery budget can only stretch so far! It could legitimately be argued that EG is not overly challenging, but it does take a good few hours to play through, and certainly offers a rewarding playing experience. To be frank, I found it necessary to take notes to remember where I had been and which species I had researched! 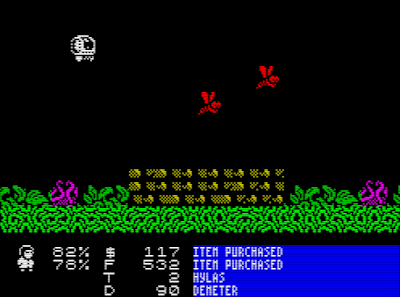 As previously mentioned, it does lack danger and thrills and spills - but to introduce (for instance) a greater shoot 'em up element would mean the game losing its charm and uniqueness. Note: This review is based on playing the game via emulation (Spectaculator and Klive) as here at RGCD we lack the original Sinclair hardware to run it on. 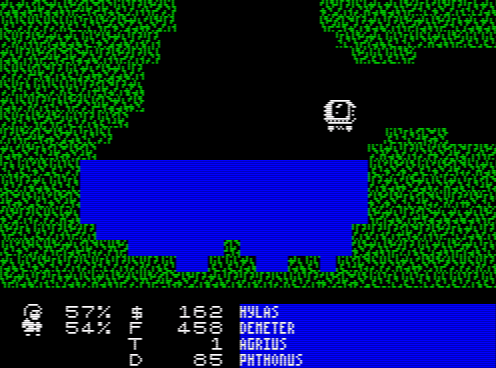 The reviewer experienced some crashes during play that are being investigated by Jonathan, but we are unsure at the time of writing if these are due to a genuine fault or simply an emulator incompatibility. As a result of this the score awarded to the game has been reduced by one point out of five. When the cause of the problem is resolved, the score will be updated accordingly. Buy the game here (from the Retro Fusion shop). Great review John! This is my favourite game JC has released to date. I love it, even with the bugs. Is there any tutorial how to use the klive emu on the interwebz? Im not able to run the game with my lack of knowlegde.